The Sri Lankan government is planning to hold victory celebrations after troops seized the last Tamil Tiger rebel base in the restive east. Officials say their capture of the rugged area of Thoppigala gives the government control of the region for the first time in 13 years. They say the fall of Thoppigala is a triumph for the military. The Tigers have responded with threats to cripple the economy with attacks on military and economic targets. The leader of the rebels' political wing, SP Thamilselvan said peace was "not possible" with President Mahinda Rajapaksa. "Our targets would be in the future major military and economic structures of the government of Sri Lanka," he told the Reuters news agency from the northern stronghold of Kilinochchi. 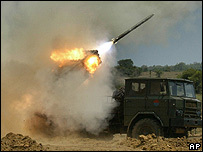 "They will be targets which help the government sustain its military operations and military rule. "For instance (our) attack on the oil installations. That is one of the targets that will cripple the economy of Sri Lanka as well as the military capability of Sri Lanka, so such will be the tactic." Government officials say there will be a "big event in Colombo in keeping with the success of the armed forces in Thoppigala". 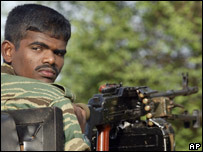 Correspondents say its capture has dealt a significant blow to the Tamil dream of establishing an independent homeland in the nation's north and east. The military offensive to recapture the east began last year. 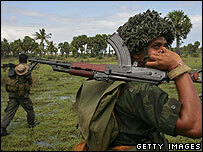 In January, troops dislodged the rebels from their eastern coastal strongholds in Batticaloa district. Former Air Marshall Harry Goonetilleke told the AP news agency that the seizure of Thoppigala was an "important success" for the military, but keeping it would not be easy. "You can win a battle with 2,000 troops, but to hold it you need 10,000 minimum," he said. The Tigers still control large parts of northern Sri Lanka, where they run a de facto state. But the government says that its troops have killed hundreds of rebels since February. The rebels dispute the casualty figures. A ceasefire signed between the two sides in 2002 is still in place on paper in Sri Lanka, although it has broken down on the ground. Much of the fighting up until now has taken place in the east. More than 60,000 people have died since the rebels began fighting for an independent homeland in the north and east in the 1970s. The Tigers say minority Tamils are discriminated against by the majority Sinhalese population.